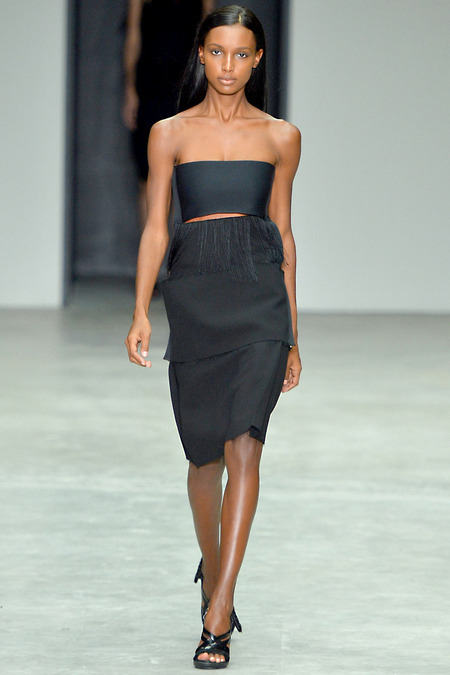 Francisco Costa’s spring/summer 2014 collection for Calvin Klein went into a different and colorful direction during this fashion show. 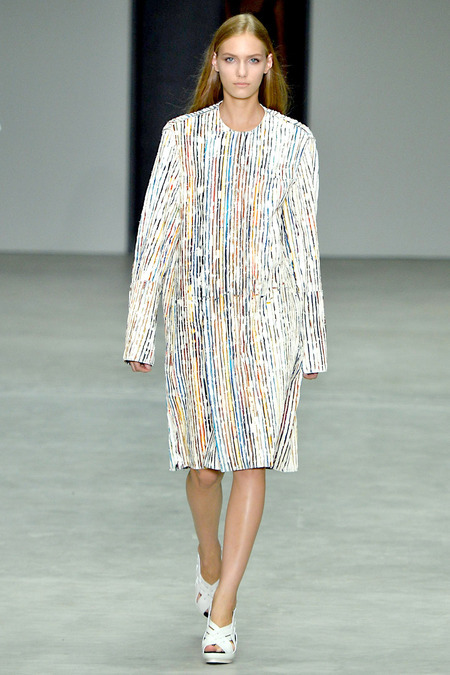 His collection was titled “Elevated Deconstruction” and featured unfinished hems on dresses, skirts, and jackets. The opening look of a double canvas strapless dress with an underlying orange detail represented the canvas of an artist’s journey. The inspirations were Pablo Picasso, Cecily Brown, and Jean-Michel Basquiat. All three artists were famous for their bold usage of color. 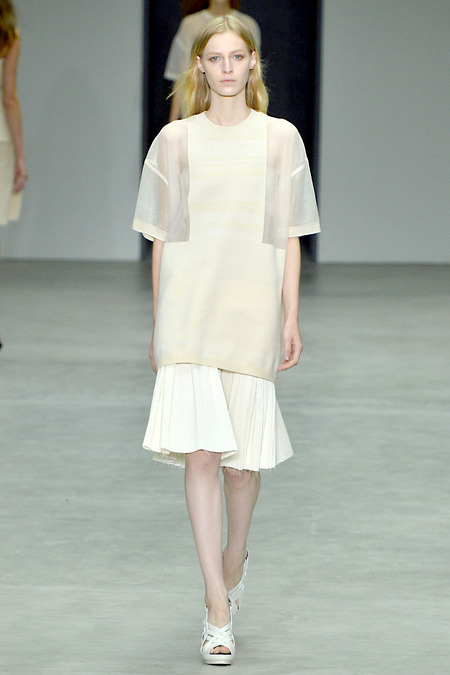 Color is not something you would not associate with the Calvin Klein woman, rather neutrals of white, gray, and black. 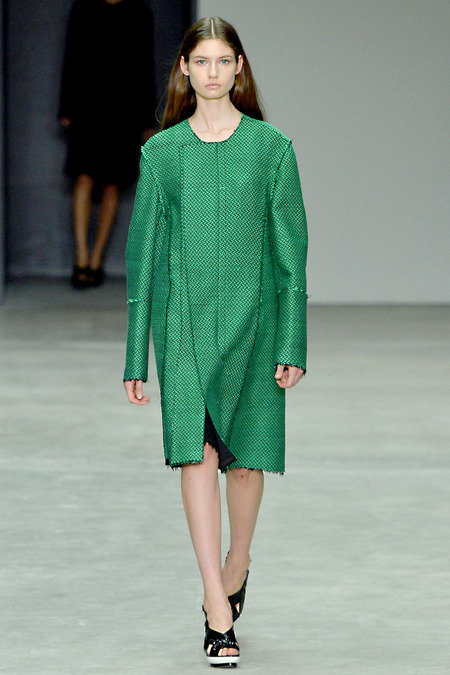 My favorite look from the collection was vivid emerald green coat with in black lining and worn with black sandals. 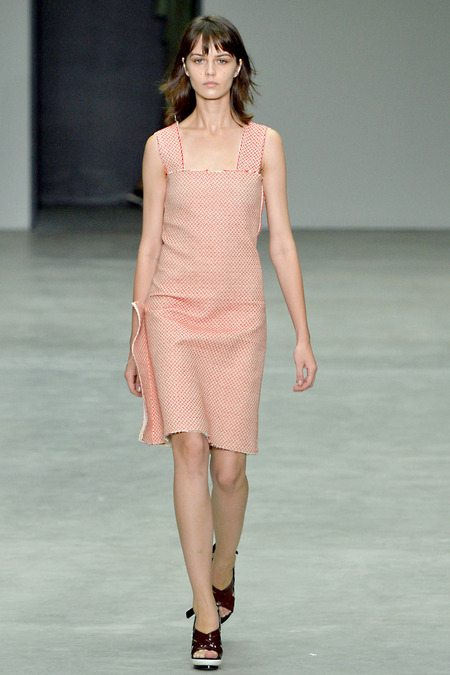 This collection also featured looks in pink, red, mint, and multi-colored threads woven into coats and dresses. 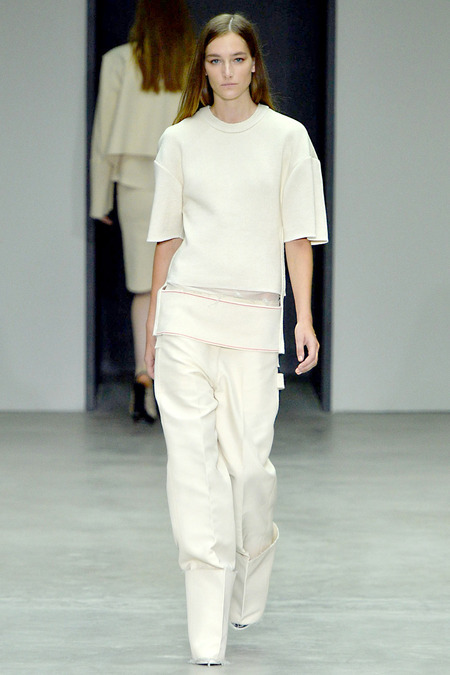 Those classic Calvin neutral were evident along with sculptural shaped jackets and skirts. There was a lot of layering of fabrics. One including cotton tweeds. Tweed is not necessary a fabric you would associate with the Calvin Klein aesthetic, rather the fabric most popular by Chanel. One look that made me think of the Parisian label was a black coat with a multi-colored threads coming out of the coat. It looks like a looked like a new interpretation of a minimalistic techno-colored dream coat. Threading and fringe was also seen on many of the different looks. There were also multi-paneled dresses, coats, and sweaters that gave a see-through effect on some pieces. The one thing you count on with any Calvin Klein piece is how versatile they are. The tops and tanks created are dressy enough to be worn with the baggy painter’s pants or even slacks for a more office appropriate look. Pair the tops down with a pair of jeans. The jackets, especially the 16th look worn by model, Cassi Van Den Dungen, was black tweed with many different colored thread woven throughout it. I found it be one of the best jackets from the collection. The two closing looks were two evening gowns, one in white and the other in black. 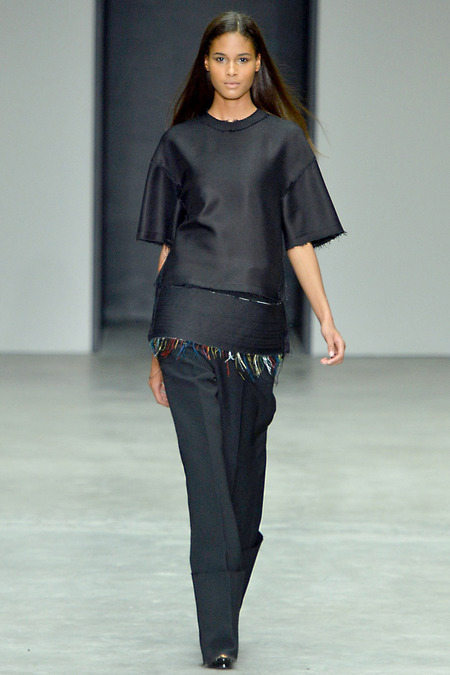 Both were beautiful and floor-length with fringe details. These dresses moved when the models walked and the fringe made it look like there were weightless feathers on them. 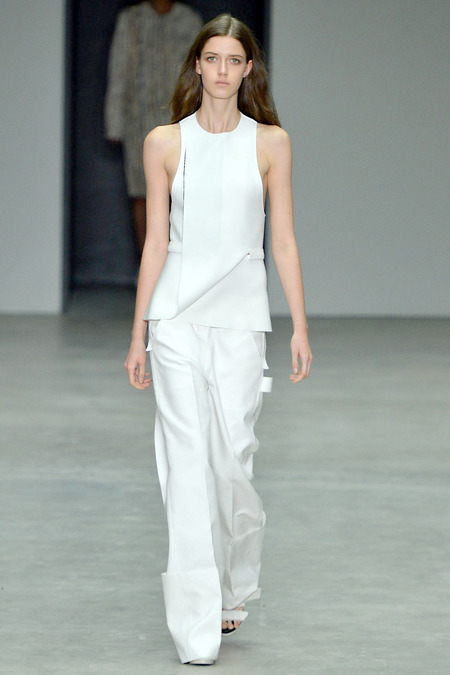 Overall Costa’s vision for the Spring/Summer 2014 Collection was new and uplifting look for the Calvin Klein woman. I wonder what his next spring/summer collection will bring us with just under a month from New York Fashion Week.